The spider became well established in various places along the south coast of England from Cornwall to Essex, and has increasingly been found established inland and further north. There are two recent records in Scotland, both believed to be the result of introduction with goods, and where long-term survival of any population is uncertain. In Europe the species is known from Ireland, France, Spain and Portugal. It is not listed in recent checklists for other western and central European countries. This spider is found mainly around houses, though more rarely indoors. It constructs a scaffold web that differs from others of the genus in the exceptional strength of the silk and in the tubular retreat that is at least partly concealed in a deep crack or hole. The species has been known to bite a human but the spider has received a lot of unjustified and inaccurate media statements about its danger to humans and its spread in Britain. Bites to humans are unlikely to happen in normal circumstances since the spiders are usually confined to their web, in cracks in walls or under window sills. 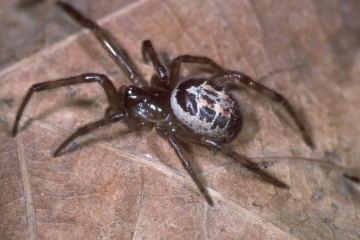 The bite in most people would be little different to a bee sting, and there are currently few definite recorded occurrences in Britain since 1979, many reports almost certainly being the result of non-spider-related causes which have incorrectly been assumed to be the result of 'false widows'. The males are mature in the summer and autumn, the females probably throughout the year. The species was first reported from near Torquay by Pickard-Cambridge (1879) and described from Britain by Snazell & Jones (1993). It is assumed to be introduced and is now naturalised in southern counties of England. It has been frequent in the southern coastal counties of England for a great many years, and is nowadays frequent and abundant in many areas of southern England and increasingly further north.